Research has shown that oral health and cardiovascular disease are related. If you suffer from any number of heart issues, it is important to inform your dentist before any major dental procedures. 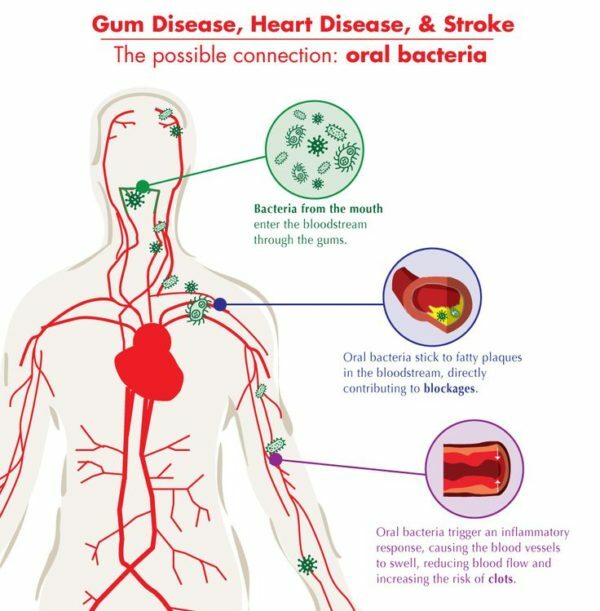 In previous posts, we looked at different ways poor oral hygiene can lead to heart disease, here we want to explore different heart conditions and what to expect regarding your oral health. If you experience a heart attack, you may feel pain from your chest spread to the lower jaw. In some cases, the pain may actually start in your jaw and spread to your arm and chest. Doctors and dentists recommend postponing any dental treatment until at least six months after your heart attack. You should inform your dentist if you’ve experienced a heart attack recently. They will need to take extra precautions such as keeping oxygen and nitroglycerin ready and available during your visit to their office. Additionally, speak with your dentist about any medications you’re taking. Your dentist will need to plan carefully; for example, if you are on anticoagulants, your blood will not clot and this could be potentially dangerous during certain dental procedures. Occasionally, you may be required to take blood tests before procedures such as gum surgery. It is important to let your dentist know if you’ve had a coronary artery bypass graft in the last six months. In most cases, you won’t need any additional tests or medications. However, one of the major complaints from patients who have undergone a coronary artery bypass graft is extreme discomfort while sitting in the dental chair. Your dentist can maneuver the chair and increase or decrease the incline of the chair to try to relieve some of the pain. Angina can affect the teeth and jaw in a few different ways. To begin with, it can cause pain in the lower jaw. Once angina has been diagnosed, some medications can lead to adverse dental side effects. Calcium channel blockers, common drugs prescribed to patients with angina, often cause gum overgrowth. If gum overgrowth occurs, you will likely need periodontal surgery. At the dentist, it’s important to inform your dentist if you suffer from angina. They will need to keep oxygen and nitroglycerin on hand during your appointment. If you suffer from unstable angina, you will need to have your heart monitored during most dental procedures. If you suffer from congestive heart failure, you may experience dry mouth due to various medications. However, your dentist won’t necessarily have to do anything special for you during your visit. In some cases, if the patient has extreme congestive heart failure, they may experience difficulty breathing and discomfort if the dental chair is positioned at a steep downward angle. Speak with your dentist to find a safe and comfortable position for the chair. Occasionally, patients may need to have their teeth treated in a more controlled hospital setting. Dentist and physicians recommend waiting a few weeks after receiving your implantation before having any elective dental care. If you have to have a surgery or procedure before then, you may need to take antibiotics. The main concern with pacemaker implantations is accidental interactions between the pacemaker and any electromagnetic devices in your dentist’s office, such as machines used for ultrasounds or electrosurgeries. Speak with your dentist prior to your visit to inform them of your condition. Your dentist can take certain precautions to avoid any potential interactions. Medications for high blood pressure often lead to many different side effects related to your dental health. You may experience dry mouth, a change in your ability to taste, or gum overgrowth. It is important that you speak with your dentist once you are diagnosed with high blood pressure. They will need to take your blood pressure at least once during each visit to establish if it is safe for you to have treatment. In most cases, patients with high blood pressure don’t need special treatment and can safely use nitrous oxide and local anesthetics among other things for dental procedures. For gum overgrowth, your dentist will remind you to maintain a strict daily tooth brushing and flossing regime. However, if the gums begin to inhibit chewing, you may need surgery. High cholesterol does not cause any oral effects; however, medications for high cholesterol can make patients feel dizzy or faint when getting up from the dental chair. It’s important for your dentist to know which drugs you’re taking. Some drugs when mixed with other medications for dental issues can cause adverse side effects. Strokes can lead to many long-term effects. Some of theses effects, such as paralysis, increased or decreased sensitivity to pain, and difficulty speaking and swallowing can directly affect your oral health. If you suffer from paralysis, you may require assistance when brushing and flossing your teeth. There are special toothbrushes and floss holders that can make these tasks more manageable. If you experience localized paralysis in your tongue, you may have trouble rinsing your mouth or even recognizing when food is still in your mouth. Dentists typically prescribe a fluoride gel or saliva substitute to help keep your mouth clean. It’s important to inform your dentist of any medications you take after your stroke. Stroke survivors often take blood thinners, which can cause complications during dental procedures. Dentists may ask to see your latest blood tests before they treat you and before prescribing any medications related to your dental health. With any medical issue related to your heart or overall health, it is important to speak with your dentist. If you take any medications, your dentist needs to know about them. Mixing medications can lead to undesirable and potentially dangerous consequences.